The Iron Ring is a symbol of prowess (and only prowess) in rapier fighting within the bounds of a particular Kingdom. Currently there are five Rings active in the Society - in the Middle Kingdom, East Kingdom, Ealdormere, Meredies, and Northshield. 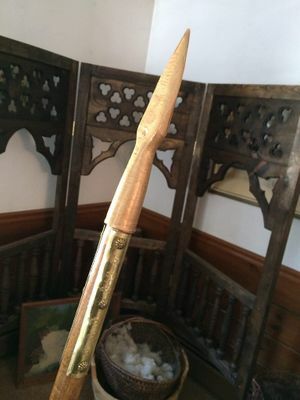 As this has become a popular way to bring the Rapier community together, the Thrown Weapons community in the East Kingdom has decided to take a similar approach and create the Golden Spear. 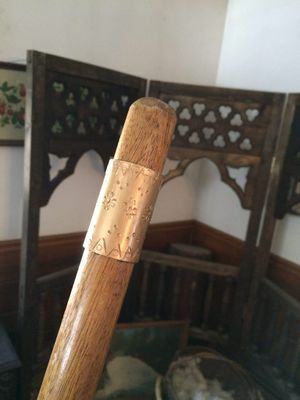 Please don't confuse this with the Golden Lance, which is an Award for prowess in the equestrian lists and demonstrated service to the Kingdom in marshalling, teaching, and helping to promote and expand the knowledge of equestrian arts. To declare the challenge the challenger declares 'I request the Challenge of the Golden Spear'. The Golden Spear may only be exchanged once in any given day; if another challenger requests a Challenge to the new holder on the day they have won the spear from another, the holder is required to decline the Challenge. Otherwise, the holder may accept up to three Challenges in a given day, assuming the holder is the victor of each preceding Challenge that day. The holder of the Golden Spear is required to accept the first Challenge in a day. The second and third Challenges are optional, and the holder should only accept those if they feel that they can show sufficient prowess and stamina after the exertions of the first Challenge. A challenger for the Golden Spear may only issue a single challenge per day. Terms for what the contest will be determined by the participants. The challenger, as part of the challenge, will name the terms of the contest at the time of the challenge. The holder of the Spear can change ONE of the terms (distance, number of throws, method of throw, etc.). Throwers must comply to the safety standards of the Marshal in Charge of the range, the East Kingdom, and SCA rules. Weapons must be SCA and East Kingdom legal. If it looks like a spear and throws like a spear, it's a spear. The Golden Spear may not reside outside of it's Kingdom's borders. As such, it will revert to the previous holder if the current holder moves from the Spear's home kingdom or stops playing. The Golden Spear shall be displayed prominently while at events and practices so potential challengers may know who is the current holder. Lastly, it is the duty of the outgoing holder of the Golden Spear to make sure the incoming holder is fully aware of these rules.